The temperatures were rapidly approaching triple digits in New York City on Tuesday, but even blistering heat couldn't deter Microsoft from bringing its flagship video game franchise to its mobile devices. Announced in June, Halo: Spartan Assault will mark the first entry on tablets and smartphones for the series when it launches on all compatible Windows 8 and Windows Phone 8 devices this month. Though it will be arriving on PCs at some point, Microsoft was rather coy about a specific release date for the game, though on July 18 it finally spilled a few of the beans. The game became available for Lumias on Verizon that day, though everyone else not on Big Red will have to wait until Aug. 16 to pick up the $6.99 (about £4.60, AU$7.25) title. In anticipation of the title's impending availability, Microsoft invited a select group of attendees to its Halo Reinvented event, giving most of the guests their first look at Spartan Assault. To this point, the Halo franchise has largely been a console-based experience, so the jump to mobile came as a bit of a surprise to longtime fans and more casual players. On Xbox, Halo has been a proven seller, capable of moving copies and systems year after year, but the Windows 8 marketplace doesn't quite have the same reach. Despite the lack of an embedded audience, Microsoft's Surface and Windows Phone teams seem confident Assault will appeal to plenty of players. "There's a million things people buy a Surface to do," said Surface Product Manager Dan Laycock. "For those that buy it for gaming, we think Halo is a perfect fit." After a few minutes playing with the both versions of Spartan Assault, fit was all we could think of when using the Surface Pro. The larger screen made it a bit easier to manage the touchscreen twin-stick shooter controls, and offered a better viewing area unobstructed by our hands. Of course, those consumers who believe in a unified ecosystem, the Windows Phone version plays well enough (save for the tighter play space), and your progress can be saved to the cloud to be resumed on any device when you resume play. 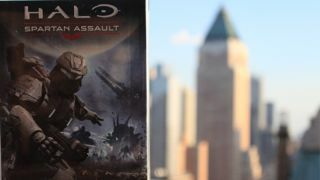 Halo: Spartan Assault wouldn't have been possible without various Microsoft teams working in tandem to bring the incredibly popular franchise to the Windows brand. Kevin Grace, 343 Industries' franchise manager, was on hand at the event and discussed a bit about how each team helped realize the completed version of the game. "The Windows Mobile and Surface teams proved invaluable, as we had to try and cram what Halo fans are used to on a big screen onto some little, bitty screens," Grace said. Spartan Assault is definitely a different Halo than fans are used to, as its top-down perspective is a major change from the standard first-person view. Still, Microsoft clearly believes the brand will do great things for its Windows mobile devices in spite of how different the overall experience is from the core title. "We expect the fact that [Halo: Spartan Assault] is available exclusively on Windows 8 and Windows Phone 8 to benefit the platform," said Windows Phone Product Manager Greg Sullivan. How easy the game is to pick up and play should bode well for its chances of success, but whether it can be the killer offering that elevates Microsoft's OSes to greater heights remains to be seen. No matter what the result, 343 Industries has definitely reinvented Halo, but now it's in consumers' hands to determine whether that's a good thing. Could Microsoft's Surface team be developing a new transparent smartwatch?